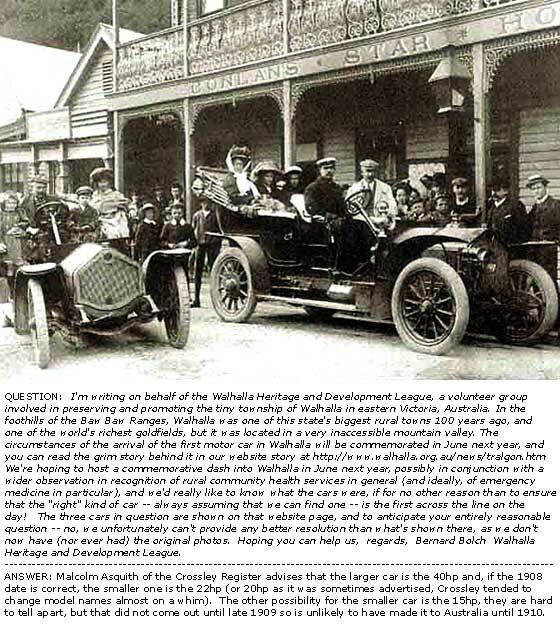 Two photos received from Bernard Bolch of the Walhalla Heritage and Development League (Australia) preparing to commemorate the arrival of the first motor car. This is the first and blurred, and shows what we believe is a 1903 De Dion Bouton 6HP. It seems to have the vertical gearchange on the steering column. The alligator bonnet top is parallel rather than the fashion for sloping forward and the dumbirons are high curved straight rather than drooping. 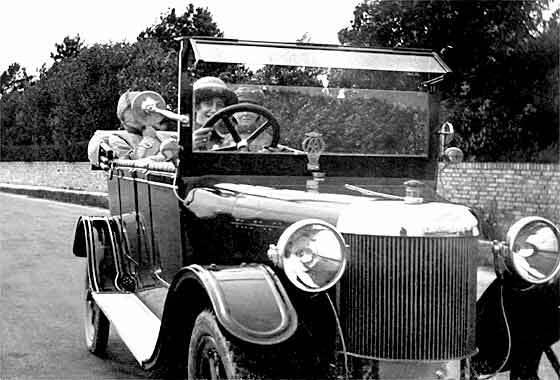 The bonnet flap opens upwards. Photo received from Michael O'Donnell (Irish Republic) with a fascinating and sad history. The car belonged to his great-grandfather Count Plunkett whose son Joseph Mary Plunkett was one of the signatories of the Irish Proclamation of Independence which led to the Easter Rising in 1916. All the signatories were shot by the British along with the other main organisers. 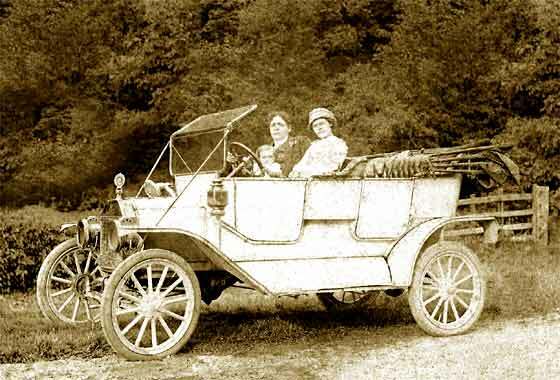 The car is a cca 1908 Mors, probably a 2.7 or a 3.5 Tourer. Registration IF 280 was issued by Cork County Cncl. 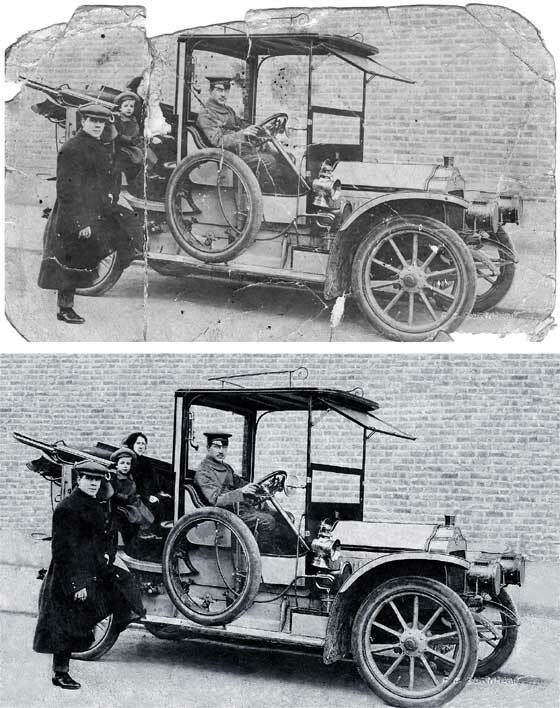 Two Photos received from Roger Brooks, Bognor Regis (UK) showing his grandfather Ernest Clark as a chauffeur. This photo is believed taken in Brixton while working for songwriter/comedian Billy Merson, one of the greats of the music hall era. Billy eventually took on in court, and lost, to Al Jolson who he accused of plagiarizing his song 'The Spaniard that Blighted My Life'. The case nearly bankrupted him. 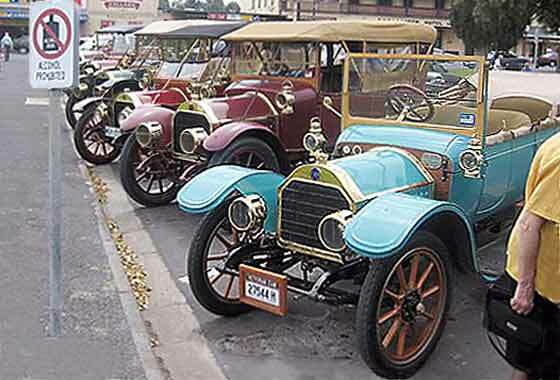 The car is a cca 1909 Minerva Type M Landaulette. We rebuilt the received damaged photo. Photograph received from Louise Dove (UK), showing her grandmother aged about 2 with her parents in their car. The photo would have been taken in about 1915 in Nottinghamshire. She has done lots of investigation but is not sure of what she should be looking for. She has tried looking for the radiator cap but to no avail. Radiator cap would be no help as it is a Royal Automobile Club badge. Transverse front spring says it is a cca 1910 Ford Model T Tourer. No numberplate is showing ? 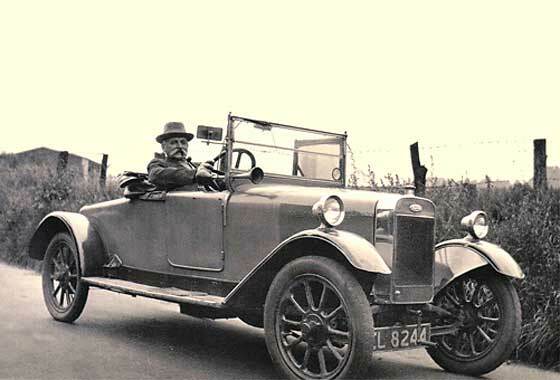 Photograph received from Terry Wigington (UK), member of the Morris Register, who has been approached by a friend compiling a book on local history, to try to identify a car owned by a local farmer. 1912 photo taken on a farm in Meldreth near Cambridge. Terry has been searching for 3 months with no success. Registration V1349 was issued by the Scottish Lanark CC in early 1912. I saw a similar car at Goodwood VSCC sprint recently, so am pretty sure this is a 1912 Vauxhall Type B. Photo of a FN spotted by Lew & Gloria Grace at a show in Naracoorte (South Australia). It is a make he had not heard of before and wanted further info. FN stands for Fabrique Nationale d'Armes de Guerre, Liege, Belgium who were foremost an arms manufacturer dating back to 1899. One of their pistols assassinated Archduke Franz Ferdinand of Austria. Went on to make cars and became one of the longest surviving Belgian manufacturers, still making army lorries and motorbikes in '65. 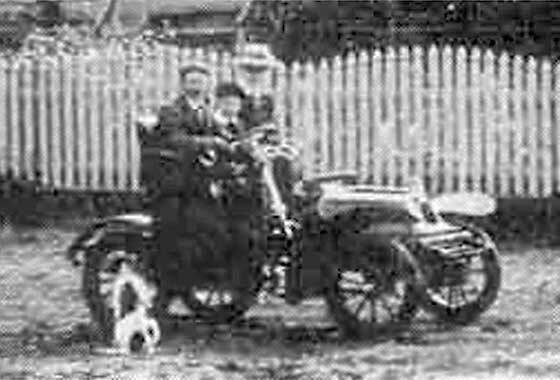 Fuzzy photo received from Grum Robertson (Scotland) of a car owned by a previous occupier of their house, the architect, and passed to them by a neighbour in Aberdeen. Was it a Bentley? No, but something equally interesting. Confirmed by our Tim Harding that this looks like a cca 1914 Vulcan 15.9 Landaulette. Possibly a little earlier. Vulcans were made in Southport, Lancs. Became part of the British Motor Trading Corp, nearly went bust, and were later known for their lorries to 1953. One of a number of photos received from Arturo Guevara Escobar, Mexico City (Mexico) taken by his grandfather Aurelio C. Castellanos. He and an uncle Heliodoro J. Gutierrez were professional photographers, working mainly in Mexico but also for a few years in the USA. Heliodoro also hired luxury cars to customers. As family we know he was a rich man, but for others say he made his money from the revolutionary turmoil. From the wheel hub and the rad this is a cca1921 Buick Tourer. 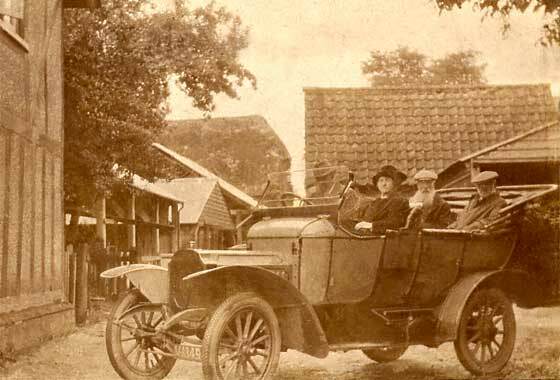 Two Photos received from Martin Gregory of Winchester (UK) hoping that someone will be able to identify the make and model of two cars from photos of his ancestors. 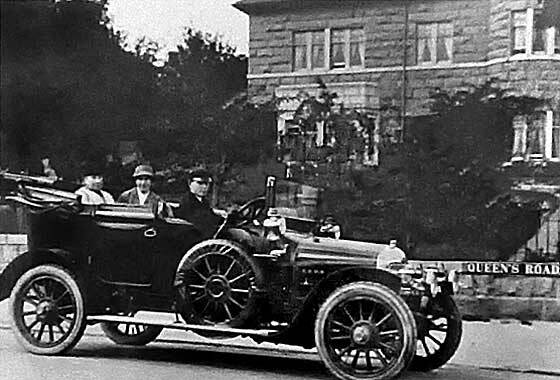 He believes the picture of the older car with 3 adults was taken in 1922. Any information such as likely date of manufacture could help him with dating the photos. Nice photo. 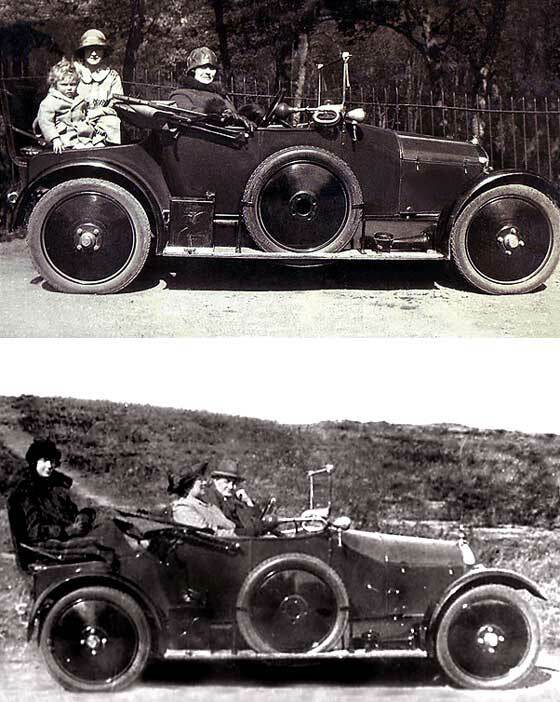 Our Simon Bishop and his Singer experts confirm that the car is a cca 1921 Singer Ten. In October 1921 they changed from artillery to disc wheels. 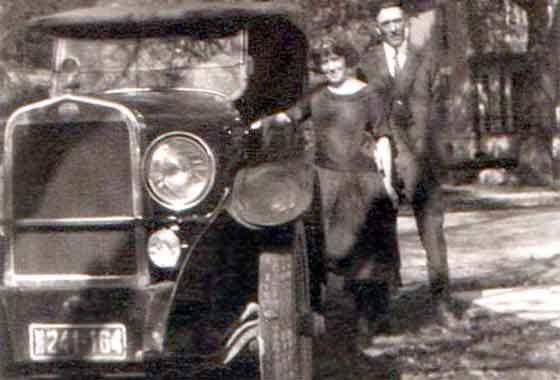 Photos received from Kevin Mikesell from Illinois (USA) trying to identify the car in this picture with his Great Aunt and Uncle. He assumes the picture was taken around 1925 in Michigan. Regretfully we are not experts on American cars and we dont think this is from the mainstream manufacturers. Much head scratching suggests this could be a Star or Durant or one of the myriad of other badge engineered makes from the same stable. Any help would be much appreciated. Photograph received from Mrs J Birch from Nueaton (UK) showing her Grandfather William Henry Barrett who was at the time living in the Pirbright area. Registration CL 8244 was issued by Norwich CBC in about 1926. The make was identified by our Tony Oakes. This is a cca 1926 Lagonda 11.9 Tourer, probably the 'simple' model with small wing mounted lights and no front brakes. This model followed the 'bullnose' 11.1 and was succeeded in 1926 by the 12/24 with more rounded rad. Photo received from Jim Type (UK). This photo is one of a number taken from glass plates he was given by an elderly lady in 1979 when he was 'on the buses' in Andover. She regularly used his bus and asked if he would like photos of buses, and other transport as she was downsizing her house and she would otherwise only have to throw them out!! Her Husband was a professional photographer in London. 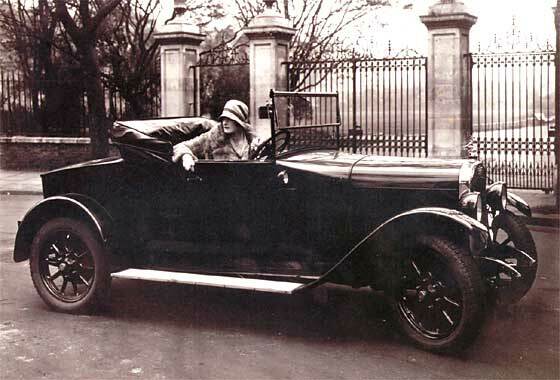 This photo is of a glamorous lady in a snazzy cca 1926 Austin 12'4 Mulliner Two Seater. One of four photos received from Richard Prickett (UK) showing some of the cars owned by his father during the 1930s. These photographs have come to light recently as part of his efforts to research his family history. 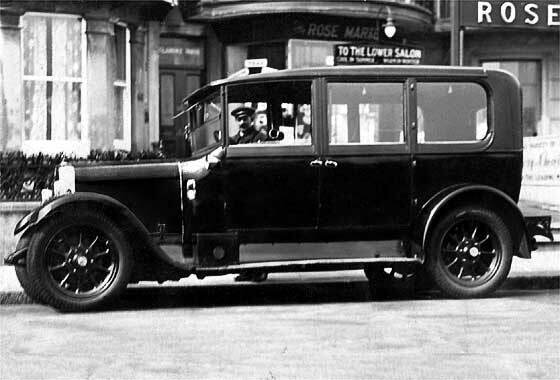 This one shows the numberplate ML 6996 which was issued by the Middlesex County Council during early 1927. 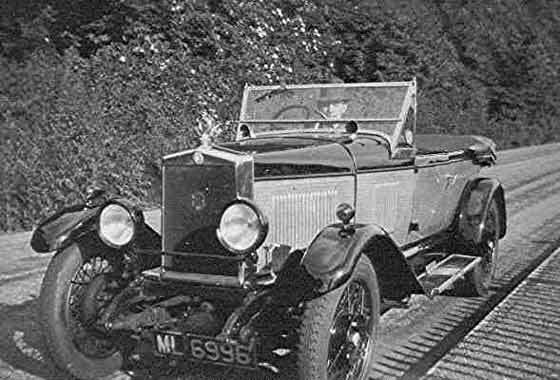 The car is therefore quite interesting as it a 1927 MG 14/28 Four Seater Sports, one of the fist 'Flatnose' MGs ( Morris Garages), and cars were based on Morrises. Two Photos received from Roger Brooks, Bognor Regis (UK) showing his grandfather Ernest Clark as a chauffeur. This photo is believed taken in Worthing between 1924 and the late 1930's, while working for the Wyatt family of Findon north of Worthing. Part of his duties was to drive Mrs. Wyatt and/or her daughter to Rose Marie's, a hairdresser's in Worthing on the seafront, and to wait for them. 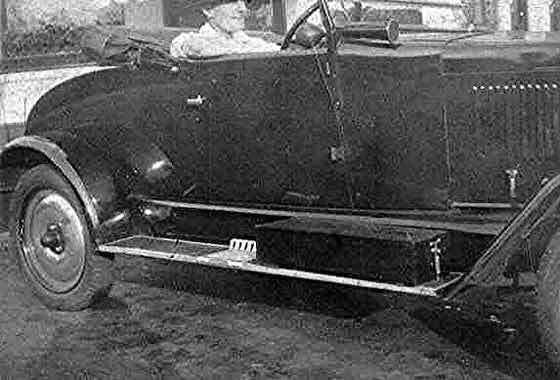 The car is a nice cca 1927 Austin 20 Limousine. The size of the side air vent helps in dating. Another from the four photos received from Richard Prickett (UK) showing some of the cars owned by his father during the 1930s. These photographs have come to light recently as part of his efforts to research his family history. All the photos were sent in low resolution, making identification difficult. Our Austin man John Caddy thinks this is a cca 1927 Austin Ranelagh Landaulette 20'6, 3400cc S.V. speed 63mph. Weight 2 tonnes. Airvent suggests the car could be bit earlier. Another from the four photos received from Richard Prickett (UK) showing some of the cars owned by his father during the 1930s. These photographs have come to light recently as part of his efforts to research his family history. All the photos were sent in low resolution, making identification difficult. This is definitely a Daimler but the numberplate is obscured so precise dating is not possible. 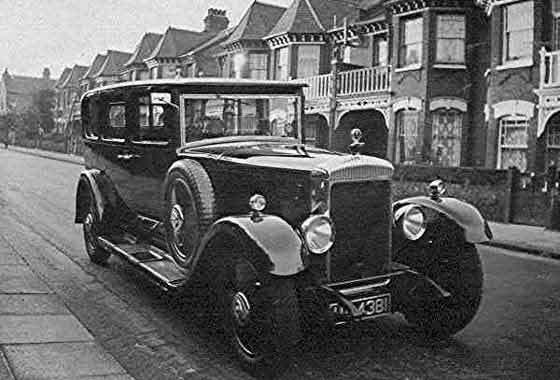 We think this is a cca 1928 Daimler 35. The model was made between 1924 and 1932. Photo received from Jim Type (UK). This photo is one of a number taken from glass plates he was given by an elderly lady in 1979 when he was 'on the buses' in Andover. She regularly used his bus and asked if he would like photos of buses, and other transport as she was downsizing her house and she would otherwise only have to throw them out!! Her Husband was a professional photographer in London. 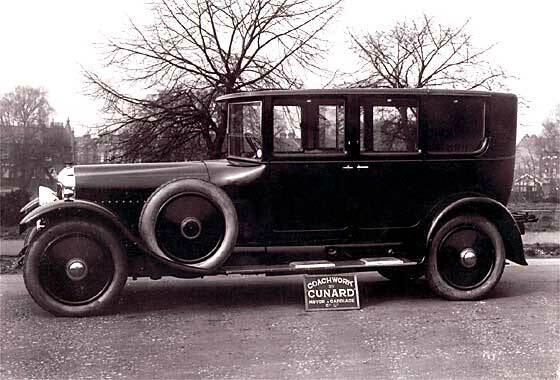 This photo is of a grand Belgian cca 1928 Minerva Limousine with a British Cunard body. Another from the four photos received from Richard Prickett (UK) showing some of the cars owned by his father during the 1930s. 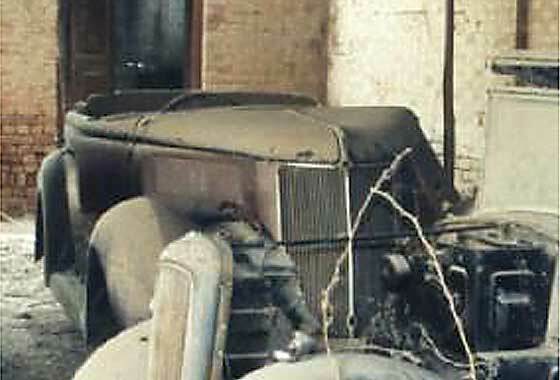 All the photos were sent in low resolution, making identification difficult; this one even more so as it shows only the rear part of the car. Our Chas Moody confirms this as a cca 1927/8 Morris Cowley, 'flatnose' variant. It is interesting to note that the wheels have 'bolt-on' disc wheel covers hiding artillery wheels underneath. Forerunners of 'wheel embellishers'. Lovely series of scans received from M J Drent of Haren (Holland) saying that the grand-parents of his wife lived in the Dutch East Indies and were rather rich. He is converting an old movie to DVD and wanted to know in what cars they drove and the planes they flew. He has identified the planes (very interested in aircraft) but could not determine the make of this car. The footage is from the early 1930's film, possibly 1934. 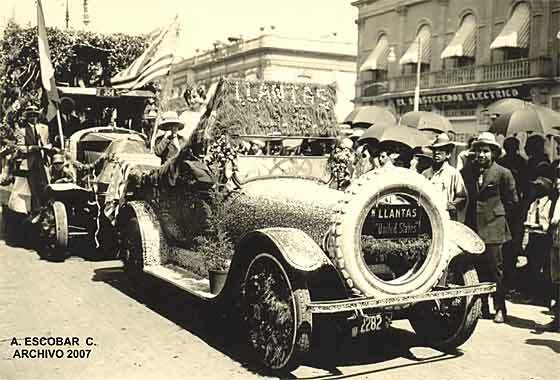 The car is a rather nice cca 1928 Buick Tourer. Two Photos received from Martin Gregory of Winchester (UK) hoping that someone will be able to identify the make and model of two cars from photos of his ancestors. 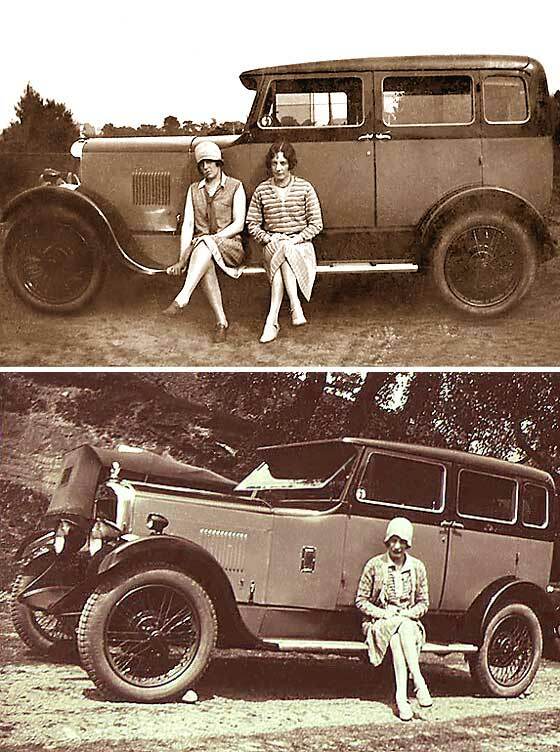 The photo of the newer car with 2 girls could not have been taken after 1931 as one of the girls was killed in a motor cycle accident during that year. Our Simon Bishop and his Singer experts confirm that the car is a cca 1929 Singer 6. The wire wheels are bit of mystery because of the fit. Normally, fitted with artillery wheels. 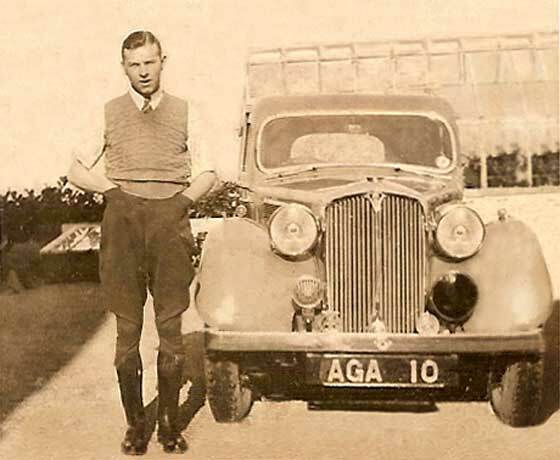 Photograph received from John Fletcher (UK) asking if we could identify his grandfather, Mr F.C.Fletcher's, car. The photo was taken in approximately 1960 in Polegate Sussex. He had just retired and this was the last car he owned. 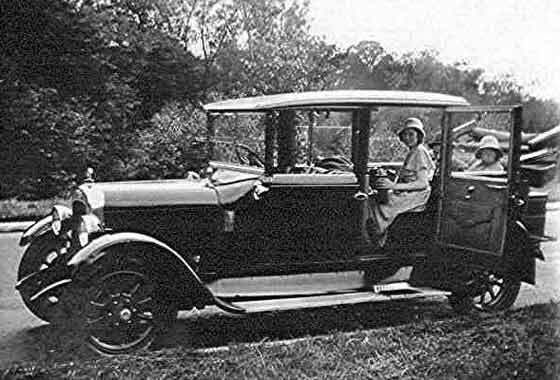 It had a lever which operated a blind that came down over the rear window to stop the glare of the headlights from behind. 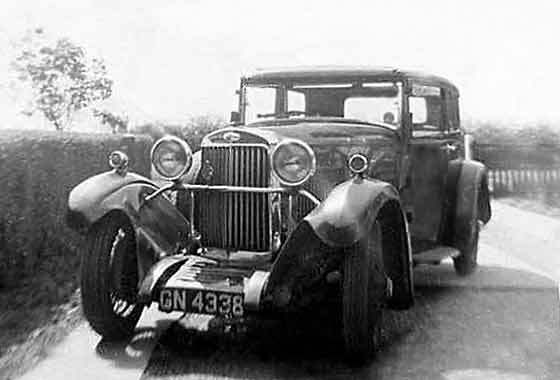 Many quality cars had them, this being a 1931 Sunbeam Speed 20. Registration GN4338 was from London County Council mid 31. Photo received from Nigel Matthews (Canada) which appeared in the Vintage Car Club of Canada newsletter. He thought it was a special of some kind, not very imaginative sheet metal panels! But probably the best one could do with limited equipment. It has been suggested by some of the British car club members in Canada that this could be a Wolseley Hornet or Riley? It is in fact an interesting 1933 Wolseley Hornet with a Parallite body. See picture for more info on the Parallite. Photo received from Gil Wilson, Sydney (Australia) of his father when he was a chauffeur to Samuel Dow, wine merchant of Glasgow. On the back is "Whitecraigs 1934, Glasgow". The registration AGA was issued by Glasgow Borough Council about September 1936, so the date on the back cannot be 1934. From the horisontal air vents on the bonnet, the car is a 1936 Rover 16. 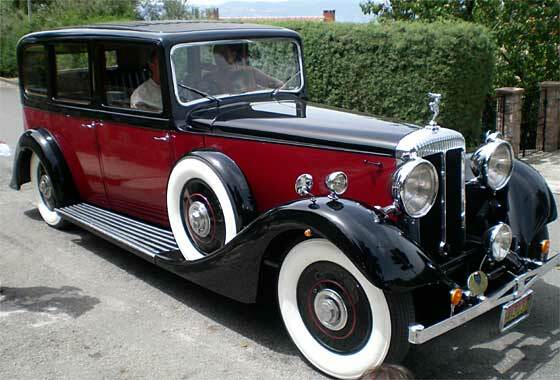 Books state that Rover P2 shape started 1937. Either this was a pre-production model or the books may just be wrong. Photo received from Shahid Ahmad writing from (United Arab Emirates) asking if we could help in identifying the car in the background, not the Austin in the foreground. The picture was taken in Pakistan about ten years ago. He thinks the car looks American, but is not very sure. The car is indeed American. Enlarging the background shows characteristic grill outline style of the mid 1930s. The car is a cca 1936 Ford. Bodywork may have been phaeton /convertible /cabriolet. Photo received from Roberto D'Amato (Italy) saying friend of his owns a 1936 Daimler, V 4.5 litre straight eight limousine, No. 43511, engine number 79744. He bought it in Indiana about 2 years ago. The US number plate was 34A3037 and the original UK numberplate was BKV 81. We have tried the Daimler Owners (DLOC) for assistance but they seem not to answer emails. The only option is for Roberto to get in touch with the UK DVLA, fill in the form and see if they have records.